Huzzah to the manitowoc county amateurs! The Manitowoc County Historical Society is proud to be the home of the Manitowoc County Amateurs Base Ball Club, a recreation of an early Manitowoc area team. Today, the team consists of local history supporters. It is an educational program at the Society designed to tell the story of baseball in the late 19th and early 20th centuries. It also demonstrates the history of social and athletic life at the turn of the century. Historic base ball is the re-creation of the styles, speech, rules and terminology of the 1860s game. It's not only a competitive game, but also a re-enactment of baseball life, similar to an American Civil War re-enactment. Visitors will be transported back in time to witness what the sport of baseball was like during and just after the Civil War by participating in or watching a rousing pick-up game. Pitchers throw underhand, batters are called strikers, strikes are called when a striker does not attempt to swing the bat after a warning from the umpire, and foul balls can be caught on the bounce for an out. 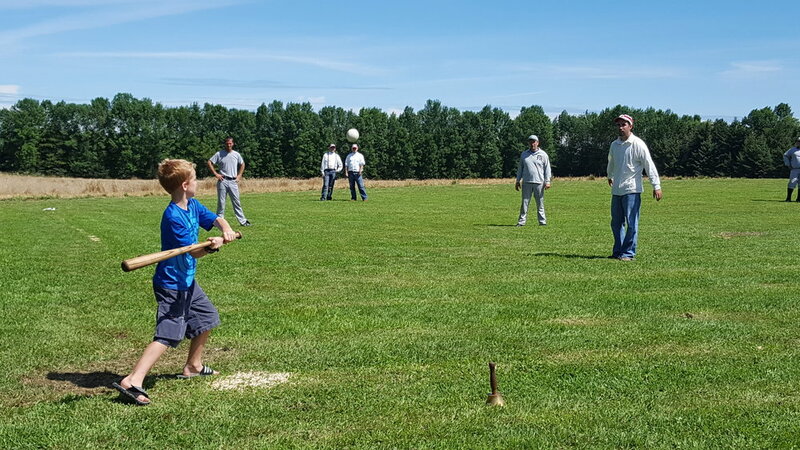 Following each match, visitors will get to field, hit and learn how to play baseball by the rules of the 1860’s. The Manitowoc Amateurs base ball team was a team made up of young men living in the third ward area of Manitowoc. In 1896, their record of games won was 17 out of 20 played and so they were recognized as amateur champions of Manitowoc county. Out-of-town trips to ball games were made by horse-drawn bus, but if the game was played at Two Rivers, bicycles were used. Team members were Wencel Kadow, Charles Schuetze, Joe Becker, Adolph and John Kadow, W. Wieboldt, D. Vollendorf, Eddie Bahr, Alex Pankratz, and Charles Schuette. Did you know that the Manitowoc County Historical Society is a Let's Move! Museum? Since 2011 when the program first began, over 700 museums of all kinds from all 50 states and the District of Columbia enthusiastically joined this effort to support a healthier generation of Americans. As part of the initiative, participating museums developed interactive exhibits, outdoor spaces, gardens, and programs that encourage families to eat healthy foods and increase physical activity.